As Small World Marketing hit its 10 year anniversary, it seemed only fitting that I should celebrate it by taking our family to Africa for the first time. There was much tutting & clucking from grandparents when I declared I was taking my kids on safari at aged 7,5 & just 3. ‘Is it safe?’ ‘What about malaria?’ “Can’t you go to Longleat which is down the road?’ I had been warned that my kids would be too young to appreciate the experience they were having……but that couldn’t have been further from the truth. As my husband and I have been lucky enough to visit ‘The Mother City’ numerous times before we decided to stay away from the main city centre & find somewhere where the pace was slightly slower and more ‘kiddie friendly’. De Noodhoek hotel in Farm Village was the perfect gentle introduction to Africa with its low key village feel but yet a stones throw from the stunning Noordhoek beach. We met up with an old friend Ingram Casey from Escape + Explore who had kindly volunteered to be our guide for the next couple of days. Escape + Explore was set up 3 years ago when Ingram saw a gap in the market to give active and adventurous visitors a chance to play like a local in Cape Town’s surrounding mountains, vineyards, and sea. 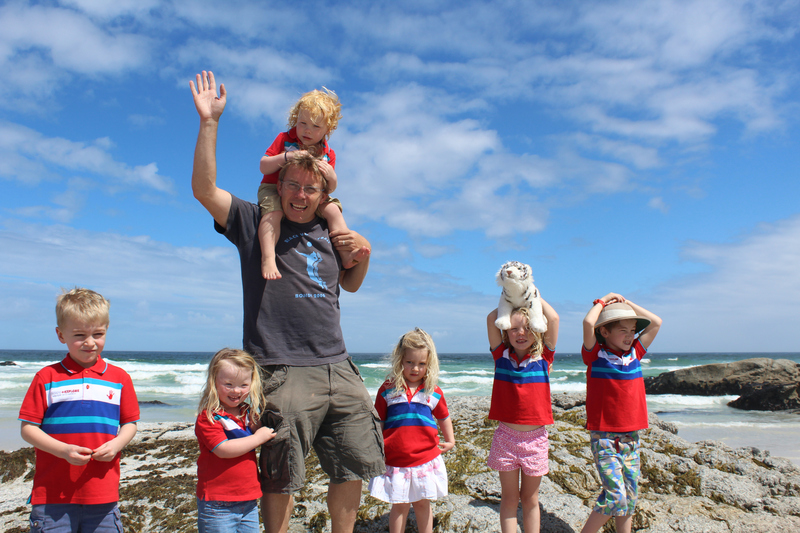 Our timing was impeccable, as Ingram had planned a Valentines Escape + Explore treasure hunt for the Noordhoek community. Our kids thought they had landed in paradise with a real life Peter Pan! After adventuring through the Enchanted Forest, jousting in the Dragon’s Den and saving Rapunzel (aka their 3 year old sister, Ella) they still had enough energy for a full footie match with their gaggle of new South African friends. The following day we set out in an ‘Escape & Explore’ Adventure Utility Vehicle (aka the ‘fun bus’) for a day of fun & frolics with Ingram as our tour guide. First stop was a surf lesson on Muizenberg beach. Under the expert tuition & patience, my husband Matt, myself and Milo, our 7 year old son all mastered standing up within a few waves. Having built up an appetite we ventured into Tigers Milk in Muizenberg where within minutes our three kids were up to their armpits in pizza dough making their own lunch. Fuelled on pizza & chocolate milk shakes, our next stop was to come face to face (a bit too close for comfort for mum!) with the seals at Kalk Bay. I’m not sure who was more fascinated by whom! A visit to see the Penguins on Boulders beach is a compulsory stop when visiting the Cape. Yet again, Escape + Explore had a little twist on this experience taking us to a secret beach only accessible to the locals & a few adventurous tourists. The kids loved braving the icy cold swimming pool sized rock pools alongside their new black & white friends. The jam packed day was great fun for us all. Ingram was every child’s dream companion, jokey and fun yet a great leader with the conversation peppered with interesting facts about Cape Town’s history, culture, and environment. The following day we ventured into Cape Town itself although sadly the wind put a stop to our plans for going up Table Mountain. Instead we explored the Waterfront although it all felt very touristy after our previous two days of living like locals! Franschhoek was our next stop and the newly opened La Cotte House. La Cotte Farm is an exciting new development just a stones throw from Franschhoek village with a 360 view of the vineyard studded valley and mountains. La Cotte House is the first phase to be opened and is an exclusive-use house which sleeps up to 12. The second phase, 8 x ‘Forest cottages’ are due to be opened in May 2016 and the piece de la resistance….the original Manor House dating from 1694 at the end of 2017. La Cotte House is vast at 400m2 and its never ending ceilings, loft French doors and traditional sash windows ensure that Franschhoek’s panoramas pour in with the sun the moment you open the blinds. The house is designed for entertaining with a vast open-plan living space, majestic fireplace and vine-dappled wrap-around terraces. The interiors are a perfect marriage of eclectic colonial and relaxed farmhouse-chic serving up a gorgeous laid-back home away from home. Unfortunately having 3 young kids in tow hampered our ability to undertake the many wine tasting tours but we still managed to fill our 5 days in Franschhoek with sampling so many of the endless incredible eating establishments. Our kids were all too happy to run around and explore the huge, stunning gardens whilst we sat back & enjoyed the local wine. There are some great kiddie friendly experiences in Franschhoek but the highlight for us the Boschendal picnic. It was a very relaxed affair with big bean bags to lounge on whilst the kids romped around the acres of garden or swung on the hammock under the pine trees. 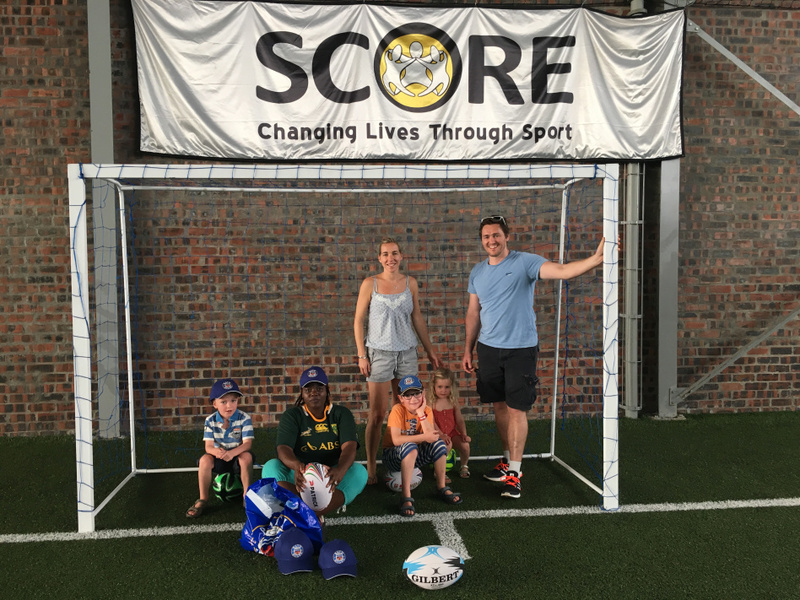 I was keen for our children to also experience the real side of Africa and we had brought a number of old toys, and rugby/footballs over with this in mind. 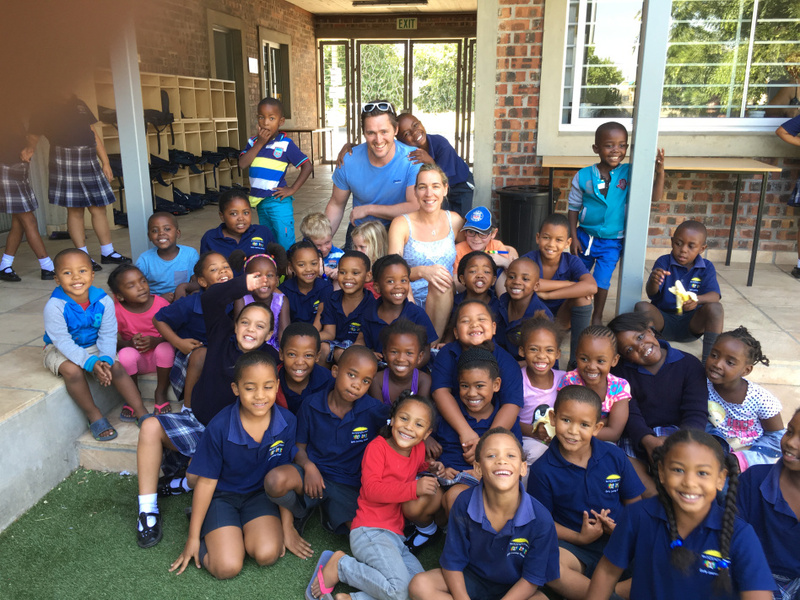 At Franschhoek we met up with the energetic, lively Doug who has set up a charity called The Kusasa Project which now helps 1500 across 5 local schools. Doug started off playing football with the township kids every Sunday; when their team numbers regularly hit 50, he realized that more needed to be done than just kicking around one football. With boundless energy and focus, he has created an incredible charity and 18 months ago a UK charity called Hope through Action helped build an incredible sports centre that would be impressive in any UK town. The sport centre not only offers after school & holiday clubs but also has programmes offering leadership and life skills. The highlight for me was being able to take our kids in to see one of their schools. I don’t know who was more fascinated by whom. The reaction of the African kids to our 3 blonde children was amazing. The girls were stroking Ella’s hair asking if she was a princess rather to her surprise. After our kids had overcome their initial shyness they soon settled down and loved playing with the school children. Its amazing how despite the vast disparity in their backgrounds, there is a universal language of playtime! Hermanus was our next stop for a pre-safari flop. We stayed at La Gratitude, an 100 year old self catering holiday home on Grotto Beach with some of the most incredible panoramic views over Walker Bay. Unfortunately it wasn’t whale viewing season but we soon filled our days were spent playing on the seemingly unending beach and exploring the milkwood forests. We culminated our holiday with our long anticipated safari. I had found it hard to find somewhere in SA which would accept children as young as ours as most lodges have policies of only accepting kids over 6. 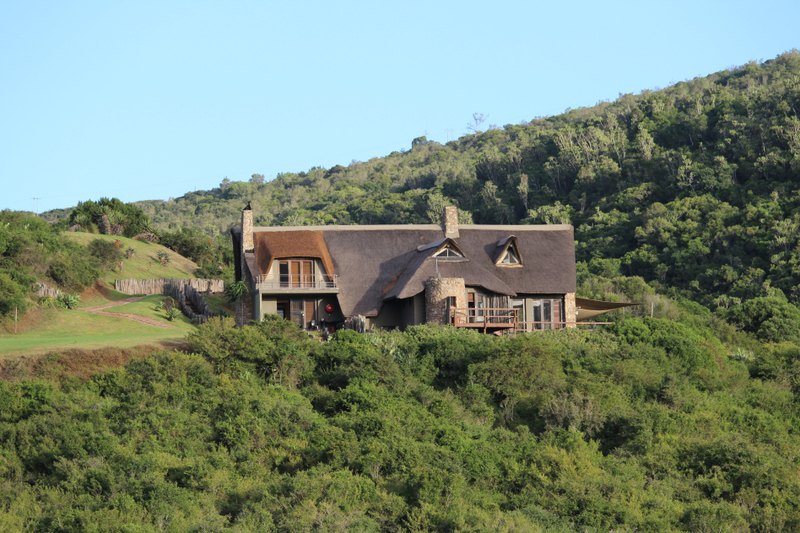 I discovered Hopewell Private Game Reserve after much research and liked the fact it was a small, exclusive-use lodge therefore had no stipulations on age restrictions. I couldn’t have chosen anywhere better. As we were the sole guests we had no concerns about upsetting any other guests or affecting their game experience. The main lodge at HopewellOur guide Etienne was fantastic with the kids. He won our boys over within minutes by showing them how to identify an animal poo (apparently you stick your finger in and lick it…that one was new to me but the boys thought it was hilarious!) He knew every inch of the terrain around the 4000km reserve and held everyone’s attention with fascinating animal facts. The game was plentiful with lots of eles, giraffes, antelope, zebra and hippo. Sadly the rhino with her newborn proved elusive but that didn’t affect the excitement of trying to find them. Etienne made the boys day by allowing them to drive the safari vehicle and sit in the trackers seat. Through all the larking about, the kids subliminally learned why preserving the bush and all its inhabitants really matters and began to understand something of the sheer, heart-thumping joy the natural world has to offer. On our dawn safaris, our bleary-eyed children soon perked up at the sight of elephants drinking at a water hole. Two boisterous young males were nick named Milo & Oscar with the little baby being called Ella. The grumpy Matriach was called ‘Mummy’……hmmm! I have been fortunate to experience many safaris but seeing the bush come to life through the eyes of my own children added a completely new dimension. 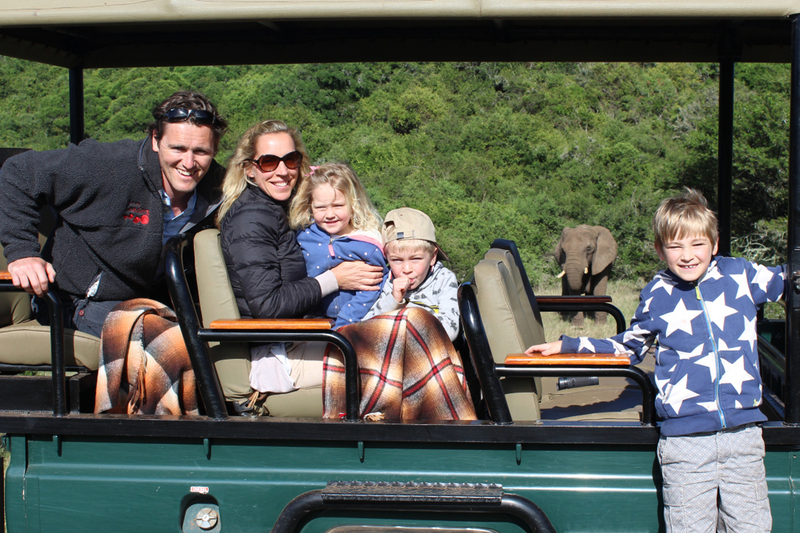 Safaris, it turns out, are a dream holiday with and for kids. There is nothing like the amazement on a child’s face when giraffes and zebras are so close that you can smell them. Teachable moments abound—about nature, evolution and poo identification. Our 5 year old was mesmerized absorbing all of the facts coming out of Etienne’s mouth and then regurgitating them over dinner. Our 3 year old didn’t want to move from watching the baby elephant and loved bouncing around in the back of the jeep on her daddy’s lap. Out of all of them our 7 year old was the most fidgety, proving that its not so much about the child’s age than their ability to sit still! If I’m honest this holiday was more for me than the kids. It was a celebration of 10 years of my company and the journey that its taken me on. It was the opportunity to exorcise the guilt-ridden burden I have carried at having to leave my kids whilst I work & to have the chance to show them the tangible results of why I do what I do. I thought that they would enjoy it but didn’t expect that our children would emerge as brave pioneers, trackers, safari jeep drivers, poo identifiers and conservationists. The sheer wide-open, big-sky, bush and animal infested brilliance of the Africa that I loved has got right under the skin of all of us and we are already planning our next trip.